Hello, nice to meet you. I am Shirley Yiping Zhang, the author of this product. Thank you for choosing this product. When you pick up this little booklet and the DVD, you have touched a part of E-Bridge Cross-Culture and Comprehensive Art, which I have been studying, thinking and exploring since 2000. Maybe you would like to ask: What is the E-BridgeCross-Culture and comprehensive art? Why did I create it? Who are its target users? The purpose I created this product is to help non-Chinese speakers to learn Chinese culture and language in the process of enjoying Chinese paintings, music and poetry. It can also be used for Chinese teachers or students who are learning Chinese language and culture as an accessible teaching or study resource. If you are one of them, you are welcome. It is just the Volume One, and its main content are shown as below. In the cultural background part, mainly I have made some brief introductions of the development of Chinese poetry, painting and relation-ship between poetry and music and so on. By reading the articles, listening to the records, and following me to read or sing the poems, you would be able to know the meaning of the poems, remember the Chinese characters, and learn their cultural background more easily. I would like to help you to remember or recite the poems easily by listening to my singing the poems in Chinese; to help you to understand the poems more directly by listening to my singing the poems in English; and to help you to feel the poems with your heart and to recite the poems more naturally by singing the poems by yourself along with the music that I have offered you.I do hope that my idea, practice and exploration will work with you indeed. I painted the 12 paintings according to the artistic conception of the 12 poems, including the poems inscribed in calligraphy and stamps, to help you to understand the meaning of the poems artistically and directly.Most of the 12 paintings in the core series are my assignments for the Chinese National Academy of Arts at which I have been a graduate student since 2011.I learned to paint them following Mr.Bonian Ren, added my own calligraphy, translation and something more to them. 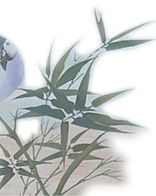 Since I just used Chinese Xieyi Painting to express the Chinese Poems’ meanings, it is just a little part of Chinese painting.It cannot show you the outline of Chinese painting. By helping you to know more about Chinese paintings, and avoiding misleading you, also, I chose some of my other paintings that I painted as my assignments for CNAA and for China Central Academy of Fine Arts, as the background, to help you to know more about Chinese painting and culture. I do hope that both you and I will learn something by studying these great poets, artists and their art works together, we are able to smell and enjoy the fragrance of the numerous beautiful flowers in the gardens of Chinese culture, arts and language. The manifestation mode of the product is music, paintings, poetry and articles, to express the ideas of the work by songs, pictures, recitations and words. This product is just a beginning of the series. Along with the time, when the Volume Two,Volume Three, and more have been published, you will see a structure of groups of the music, paintings, poetry and articles, to support the series product as the pillars of the cross-culture and comprehensive Chinese art series products. In future editions, the content list of the series will be enlarged, and then extend to more subfamilies. Art's instrumental character, Chinese paintings' comprehensiveness, Chinese primary words' universality, stability and productiveness, make up the theoretical basis of the product. ―Art is, in essence, a tool. Artists express their thoughts and feelings in different art languages, governments use the ideas in the arts to help them to manage their countries and ordinary people choose arts to please themselves.Just like the different tableware on a dining table can substitute for, complement and support each other to help the diner to enjoy his food more comfortably,sister arts can also interact to affect the audience more naturally. Combining the process of learning a culture or a language with the process of enjoying other various art forms, will make the whole process more interesting and enjoyable, and help learners to grasp knowledge and skills more easily. ―Traditional Chinese arts are essentially comprehensive. Chinese painting is made up of poetry, calligraphy, painting and stamp; Chinese classical poems were sung in ancient times; Chinese calligraphy and paintings come from the same rootstock; Chinese traditional art theory emphasizes that a good painting should include the artistic conception of a poem and a good poem should include artistic conception of a painting. By enjoying the comprehensive art (including paintings, music, poems and articles) in this product, you will just be learning Chinese culture and language naturally. ―Chinese classical poems are mainly made up of Chinese primary words. Chinese primary words are universal (they are used by all Chinese speakers), stable (they have been using since they were created) and they have prolificacy (they are the roots of new words). Learning Chinese classical poetry is the best way to encounter Chinese primary words and to open the gate of Chinese language and culture. Therefore, almost all Chinese children start their Chinese learning by reciting classical poems. Based on the above understanding, I choose Chinese painting as this product's one of media, focusing on the core of Chinese paintings-poetry and adding music, languages (Chinese and English), literature (poetry comments), historical background (about the poets and the stories behind the poems), to create a new and unique comprehensive art, to help non-Chinese speakers to know more about Chinese culture and language artistically, easily and naturally. It will be delivered with multi-media style, Internet, paper, DVD, TV, mobile phone and face to face. After my studying, thinking about and exploring on the project for more than 10 years, with the good help of many people and organizations, the first little publication of the series products has been dedicated to you. The subsequent products will be developed and published regularly. I do hope it will be of some help for you to learn Chinese culture and language. And I would really like to receive your comments, suggestions and get your feedback and good directions. During the process of creating and editing, I have gotten so much care, help and direction from so many people and organizations. I would really like to thank them and introduce them to you with a grateful heart. 徐义雄先生Mr. Yixiong Xu(China)―The President of Jinan University Press;it was he who suggested the idea of creating a cross- cultural research project in 2009 and since then, he and his team have been directing, helping and supporting me with my work on it. 蒋亚平教授Prof. Yaping Jiang (China)―The founder of and the first editor in chief of People's Daily Online and Nieman Scholar of Harvard University, Deputy Secretary-general of China Land Science Society and the former President of China's Land Resources Newspaper Office;he led me into the Internet field in 1997 and he has encouraged me and given me good advice about my study, thinking and exploration on the project since 2005. 史蒂芬・H.罗宾耐特先生 Mr. Stephen H.Robinette (USA)―Assistant Vice President of Missouri State University, he has given me many kind directions, much advice and actual help on this project and American culture study since 2009. 满维起教授 Prof. Weiqi Man (China)―Executive Deputy Dean of Chinese Painting School at Chinese National Academy of Arts, tutor of masters students, a member of the Chinese Artists Association. He has directed me to paint in person and he has encouraged and supported me to study, research and explore this project at CNAA since 2011. 麦克・乔伊斯先生Mr. Mike Joyce (UK)―A native English speaker, he has been my English tutor since 2002. He has checked all of the articles and text files for this project. 严文荣・沙芬博士 Dr. Wenrong Yan Schaefer (USA)―The Asian Arts and Letters Coordinator in Missouri State University, she has checked the“Foreword” and corrected my writing. 宫小欧Mr. Sean Xiaoou Gong(USA)―My first private tutor and schoolfellow in America, with his great effort and patience and in his vacation, and free time, he helped me hold the essential knowledge and skills in the most difficult crosses. 蒙伟业教授Prof. Weiye Meng (China)―A music professor who graduated from the Central Conservatory of Music.He checked and corrected my music score, coached me in my singing, directed me in making the recordings and accompanied me on the piano for all the songs on the recording. 马萱老师 Ms. Xuan Ma (China)―My first music teacher from 2002 to 2007. She witnessed how I created more than 130 pieces of music for Chinese poems. She coached me to sing the poems for the project in Beijing in 2012 and she directed a part of my singings and record for this project in Shenzhen in 2012. 韩学中教授 Prof. Xuezhong Han (China)―Director of Teaching Department of Graduate School and Chinese Painting School at Chinese National Academy of Arts, a judge of the senior professional titles of CNAA, a member of the Council of the Research Society of Chinese Gongbi Zhong Cai (Painting with Exact Delineation and Enriched Colors) of Chinese Artists Association, he instructed me in the painting colors, structures and in my transition from an amateur painter to be a professional painter. 吴彤老师Mr. Tong Wu(China)―Deputy Director of Teaching Department of the Chinese Painting School at Chinese National Academy of Arts, he helped and directed me most in my Chinese painting at CNAA. 卢文清老师Mr. Wenqing Lu(China)―My instructor of Chinese Flower and Bird Painting and my Class Adviser at Chinese National Academy of Arts. He directed me in all my paintings and nature sketches at CNAA. 孙琪老师Mr. Qi Sun(China)―A member of the Chinese Artists Association, he helped me choose Chinese National Academy of Arts to study and to work on the project, he directed me not only on Chinese Flower and Bird Painting, but also on Chinese Landscapes. 李刚老师Mr. Gang Li（China）―My first teacher of Landscape at China Central Academy of Fine Arts and my Class Adviser, the good foundation that was made at CAFA helped me become a graduate student and to work on the project continuously. 陶辉教授Prof. Hui Tao (China)―My first Chinese painting teacher who taught me for 8 years since 2003, and it laid the basic foundations for me to enter the art schools in Beijing and work on the project. 张全先生 Charlie Quan Zhang (China)―Assistant General manager of the network company of Securities Times Newspaper Office and my work partner. He developed the software related to this project. 周红叶小姐、罗诗忆先生Ms. Tina Hongye Zhou and Mr.Shiyi Luo(China)―They did the art design of the covers of the book, DVD and the web site. 江泓博士Dr. Hong Jiang (China)―He checked a part of art works for the project and he gave me some good directions and encouragements in person. 霍学文博士 Dr. Xuewen Huo (China)―He offered much actual practical help during my most difficult times of working on this project. 马英先生 Mr. Ying Ma （China）―He introduced me to some famous scholars of Chinese culture and improved the quality of the project. 张根记先生 Mr. Genji Zhang (China)―He heard my ideas about this project and gave me some good directions. 方竹兰博士 Dr. Zhulan Fang (China)―A professor and tutor of doctoral students at Renmin University of China, visiting scholar at Stanford University and University of Sussex, she gave me much good advice and practical help. 王华博士 Dr.Hua Wang（China）―The President of Guangdong University of Business Studies , former Vice President of Jinan University and a tutor of doctoral students, he offered the practical help for my first translated series of books and the connection between the publishing house and me. 金凤强先生Mr. Fengqiang Jin (China)―The Assistant President of Jinan University Press and General Manager of Marketing Company of Jinan University Press, he did many jobs related to the product design and he organized this product's publishing work. 张晓岗老师 Ms. Xiaogang Zhang (China)―A senior English teacher, she has checked all my poem translations and the‘foreword“. Mr. Ben Moore (USA)―He listened to all my English singing and helped to correct my pronunciation. Mr. James Broadbent（Canada）―He has corrected all my translations of the poems and one article. Mr. William Gary (USA)―He has corrected some of my poetry translations for the project..
Dr. Steve Olson (USA)―He has corrected some of my translations of the poems for the project. Dr. J. Darragh M. Elliott ( Canada）―An art appraiser and singer, he has critiqued my art and he has provided assistance in developing my singing abilities. He has corrected some of my poems. Dr. Bill R. Booth (USA)―A Professor Emeritus of Arts and my American art mentor, he has given me much good advice since 2009. 周毅然先生Mr.Yiran Zhou（USA）―A Chinese teacher in America, he has checked a part of my writing and he has given me a hand with this project. 张红阳先生 Mr. Hongyang Zhang (China)―The Music Director of Shenzhen Red Culture Art Spread Co. Ltd., who offered much convenience for my music job in his company. 欧德建先生 Mr. Dejian Ou (China )―Sound Engineer, he made the recording and mixed of the music and singing for the project. 徐洁斌先生 Mr.Jiebin Xu(China)―An art designer, he helped me deal with some photos of the product. 田松青先生 Mr. Songqing Tian (China)―Assistant President of Shanghai Ancient Books Publishing House, he gave me much good advice on how to publish this product. 程培松先生 Mr. Peisong Cheng (China)―The Deputy Editor-in-Chief of Shanghai Securities Times Newspaper Office, he gave me much good advice about how to publish this publication. 郑初一先生 Mr. Chuyi Zheng (China )―A Department Director at Shanghai Securities Times Newspaper Office, he offered me actual help on how to publish this publication. 张辉先生 Mr. Hui Zhang (China)―An Editor from Beijing Office of Tianjin People's Fine Arts Publishing House, he gave me much good advice. 杨广印同学 Mr. Guangyin Yang (China)―An artist from Shandong, the former monitor of our class at CAFA, he offered much help and advice on the project in CNAA in Beijing. 刘治平同学 Mr. Zhiping Liu (China)―An artist from Liaoning, my former classmate in CAFA, he offered much help while I studied and worked on the project in Beijing. 吴德华、曹雪芬老师 Mr. Dehua Wu and Mrs. Xuefen Cao (China)―My former colleagues and they offered much help in Beijing. 于延杰女士 Mrs. Yanjie Yu (China)―My former colleague and she offered much help while I was in Shenzhen. The tutors who have taught and directed me face to face at Chinese National Academy of Arts:田黎明教授Prof.Liming Tian,许俊教授Prof.Jun Xu,张鸿飞教授Prof. Hongfei Zhang,苗在新教授Prof. Zaixin Miao,李乃宙教授Prof. Naizhou Li,何延�唇淌�Prof. Yanzhe He,韩敬伟教授Prof. Jingwei Han,曾先国教授Prof. Xianguo Zeng,王同君教授Prof. Tongjun Wang,林若曦教授Prof. Ruoxi Lin,刘选让教授Prof. Xuanrang Liu,刘万鸣副教授Associate Prof. Wanming Liu,潘樱副教授Associate Prof. Ying Pan,赵国经、王美芳老师Mr.Guojing Zhao and Mrs.Meifang Wang,田云鹏先生Mr.Yunpeng Tian,曹传真先生Mr. Chuanzhen Cao,吴冰博士Dr. Bing Wu,刘波博士Dr. Bo Liu,曹建华博士Dr. Jianhua Cao，李雪松老师Mr. Xuesong Li.唐永力教授Prof. Yongli Tang,陈平教授Prof. Ping Chen, 李洋教授Prof. Yang Li, 苏百君教授Prof. Baijun Su,崔晓东教授Prof. Xiaodong Cui,姚明京教授Prof. Mingjing Yao,李铁生副教授Associate Prof. Tiesheng Li,刘庆和副教授Associate Prof. Qinghe Liu,于光华副教授Associate Prof. Guanghua Yu,姚舜熙副教授Associate Prof. Shunxi Yao,刘荣副教授Associate Prof. Rong Liu,毕建勋副教授Associate Prof.Jianxun Bi,岳黔山副教授Associate Prof. Qianshan Yue,丘挺副教授Associate Prof. Ting Qiu,徐海副教授Associate Prof.Hai Xu,谢青博士Dr. Qing Xie,金瑞老师Mr. Rui Jin,张弓老师Mr. Gong Zhang,林彬老师Mr. Bin Lin and张猛Mr. Meng Zhang. Especially, I would like to thank my doctors:张秋娟教授 Prof. Qiujuan Zhang,刘郁博士 Dr. Yu Liu，宋阳医生 Dr. Yang Song，刘蓉医生Dr. Rong Liu，刘映霞博士 Dr. Yingxia Liu，袁志东医生 Dr. Zhidong Yuan, 林琦医生 Dr. Qi Lin and many other doctors and nurses for their good help；I would also like to thank Shenzhen Securities Information Co. Ltd., Shenzhen City Panorama Co. Ltd. and my bosses:周明先生 Mr. Ming Zhou and 郑颂博士 Dr. Song Zheng for their sincere understanding, help and support. Shenzhen E-bridge Science and Technology Development Co., Ltd.;Jiangsu E-bridge Culture Development Co.,Ltd. Ltd. and Shenzhen Red Culture Art Spread Co., Ltd. offered the technology and record support. Mastermind, Translator,Writer Painter, Composer, Singer and Recorder of the product:张一平 Shirley Yiping Zhang (China)―I was born in Beijing. I have majored in Chinese language and literature, world economics, journalism (news), international business administration and business administration, English and Chinese painting at eight universities in China and in USA. Now I am a full-time Chinese painting graduate student at Chinese National Academy of Arts in Beijing. I started to write about Chinese culture in English in 1999, and I had the idea of starting a cross-cultural project after I heard how much different English in different countries while on a travel to Europe in 2000. Then I masterminded and translated (from English to Chinese) the first E-bridge series books, Together with Me: Learn True American English which includes 4 volumes, 4 CDs and contained 0.93 million words. With good help from a group of American, Canadian and Chinese friends, it was published by Jinan University Press in Oct., 2002. I started to learn vocal music in Nov., 2002, and re-started to learn painting in 2003 ( my childhood dream was to be an artist of painting and music, but I stopped painting since I entered university), then I started to create music for Chinese poems, to sing them in Chinese, and to translate the poems, folk songs into English while, at the same time, I founded the website in 2005. In 2007, I started to create paintings for Chinese classical poems and I tried singing them in English. In 2008, I became a part-time student of Beijing Foreign Studies University online, then I went to Missouri State University, USA, as a master degree student even though I had already got a doctoral degree. From 2009 to 2011, I held 3 art exhibitions, visited 23 public schools, 4 universities, an arts centre and participated in a World Language Conference to introduce Chinese culture by means of my own comprehensive art with painting, singing, poetry and lectures 42 times in USA. From 2010 until now, I have been a full-time Chinese Painting student at China Central Academy of Fine Arts and at Chinese National Academy of Arts in Beijing. My dream is to create a unique, artistic series product and service that is focused on Chinese poetry, painting and music, to help non-Chinese speakers learn Chinese culture and language naturally, artistically and more easily; to help Chinese teenagers from the remote and poor areas by inviting them to be this project's learners and participators. I wish it to be mainly delivered by Internet, multi-media, and face to face. Now I have made a model. I will invite more professional artists, musicians, scholars of Chinese teenagers to work with me in future editions, to creat more and better works along with the time. As the initiator of this project, I would really like to hear your comments and suggestions and hope to get your direction and advice. Thank you for choosing this publication once more.